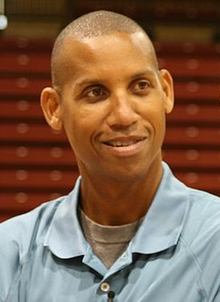 Reginald Wayne Miller (August 24, 1965) is a retired American basketball player. Miller was known for being a great jump shooter during his career. He played his entire career for the Indiana Pacers of the National Basketball Association (NBA). He is from Riverside, California. This page was last changed on 17 July 2018, at 04:20.